Fit is the most important aspect of clothing. It’s something I’ve always believed and it bears repeating. Quality is perhaps next, and you need style in anything, but fit is criminally ignored by most men - usually in favour of some presumed shortcut to style, such as a brand name. And knitwear is probably the hardest thing to find a good fit for. 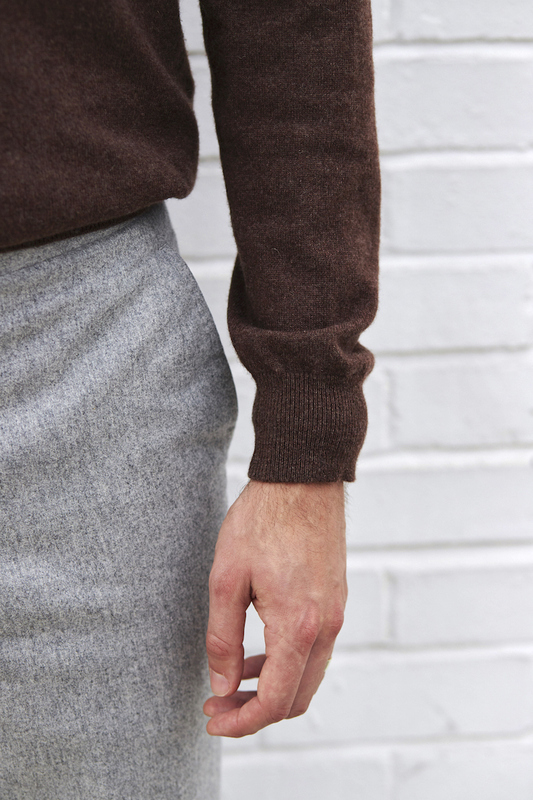 Granted, the natural stretch of wool and of knitting means fit is less noticeable than with a shirt or jacket. But it’s still important, and few people carry different fits. So if you're particularly tall or have particularly long arms, knitwear can be a pain. Or like me, if you are slightly non-average (a size 40 chest but 38 waist) and are just obsessive about fit. I’ve tried various MTM knitwear offerings in the past, including Loro Piana (good but only on the second try) and Simone Abbarchi (OK, but not always offered now). I was pretty excited, therefore, to try the MTM service from Saman Amel. Both because Saman and Dag had already proved to be very good at fitting with my jacket, and because of the style input they always bring. The kind of twin-set style of their campaign image below, for example, is something I would never normally consider, but might do with their input. And even the colour combination of white/camel/cream is inspiring on its own. The first thing I had made was a half-zip cashmere sweater. 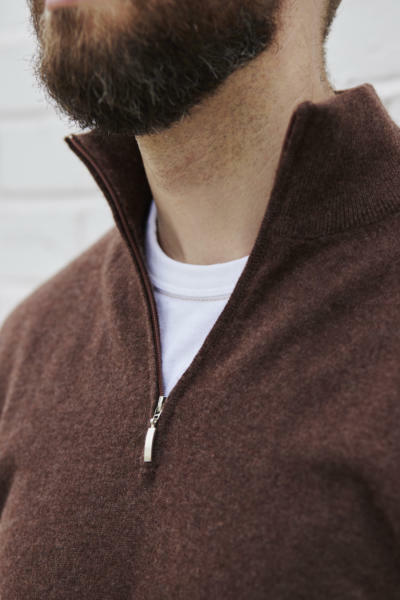 I like half zips because my long neck means a crewneck or V-neck is unflattering with just a T-shirt underneath. I need something a little higher. Importantly, although Saman took measurements as well, we tried on sized garments in order to check what needed changing from their regular fits. In my experience, this is often a big problem with MTM knitwear. It’s hard to communicate for either salesperson or customer exactly how the knitwear should fit (frankly, often the customer doesn’t know and the salesperson can’t explain) and the end product suffers as a result. So we tried on a 38 and a 40 chest (well, European so 48 and 50), decided the 40 was the better fit in the shoulders and chest, and made adjustments from there. The piece that came back was beautifully made - in a lovely Loro Piana cashmere - but needed a couple of tweaks on the fit. It was a centimetre or two short in the arms and in the body, although perfect elsewhere. That’s pretty good for MTM knitwear on a first-time customer; and even better, Dag said they would make changes like this as standard, particularly on a first order when both sides are working out the best fit. The next iteration was perfect (shown above and below). That same size 40 shoulders, slimmer in the waist, and the right length in arm and body. It's also worth saying that, with knitwear, we are strictly working in two-dimensional calculations of width, length, circumference etc. There's no coping with my hollow lower back - in the way that darts on a shirt, or the central seam on a jacket, could do. The only style point that Saman and I slightly disagree on is the material of the zip. He prefers a plastic zip with a metal puller, so the zip can match the colour of the knitwear. Personally I think a plastic zip feels a little cheap, and would prefer metal zip even if it didn’t match the knitwear. But it’s not a big point - and, just as I expected, Saman had a well-considered reason for the choice. I asked almost purely to hear what his reasoning was. Emboldened by this first success, I then tried a navy MTM hoodie. 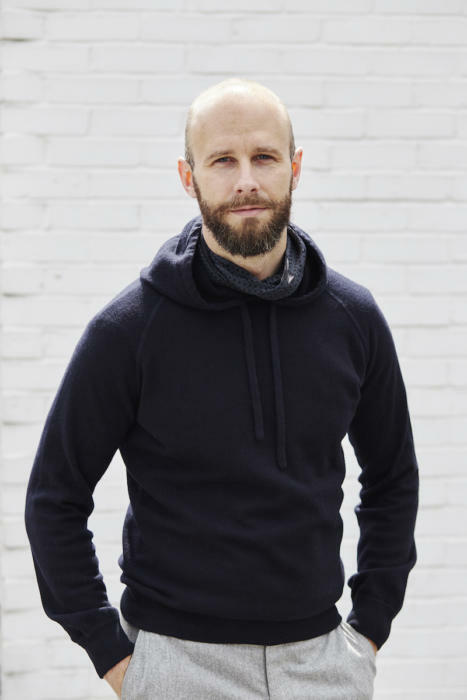 I know many readers think a hoodie will always be too casual to wear with tailoring, but I like them both with jeans and trainers, and dressed up with flannels or tailored cotton trousers (see Plaza shoot here). And although I had always done so (I gave away an old Al Bazar navy one when I had this one made), I was also encouraged in this choice by the Saman Amel styling, which regularly shows knitwear worn in exactly this way. Another style point was the subtlety of how the hoodies are designed, with a raglan sleeve and broad, flat pulls. The pulls are a little dressier than most hoodies, while the raglan rather than set-in sleeve makes them look sportier. The fit was also perfect this time around. Again, we tried sizes of the hoodie in order to find the right combinations of chest, waist, hips and sleeve (the pattern is different to the half-zip and other models). Based on this experience, I have no hesitation in recommending the Saman Amel knitwear. It’s not cheap in cashmere (SKr4500, £380) but is actually the same price as ready-made, just with the need for appointments and fitting. 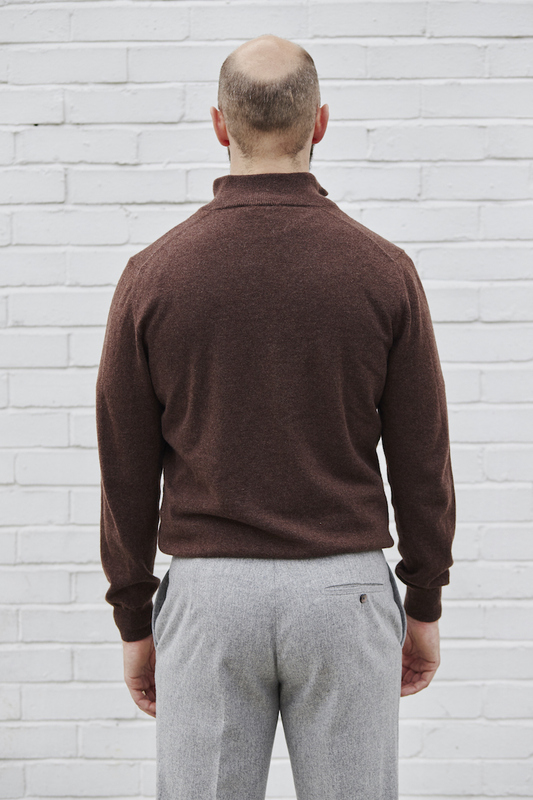 The merino wool and cotton are more affordable at SKr2200 (£186) and vicuna is much, much more. The trousers we’ve had slightly more issues with, but I’ll review them when those are all corrected. You can follow the discussion on Saman Amel knitwear: Review by entering your email address in the box below. You will then receive an email every time a new comment is added. These will also contain a link to a page where you can stop the alerts, and remove all of your related data from the site. Gorgeous! Very impressed with what they’re doing, their skills and last, but certainly not least, their aesthetic preferences/sense of style. I have definitely been looking forward to a new review of them. Although I’m biased (read: Danish) in being partial to the Scandi aesthetic of a bit of minimalism, I really think they offer something unique. Congrats on your new buys! Both pieces look wonderful and I’m not surprised that Saman Amel nailed it. Mansy, you are a Permanent Style scholar! I applaud you almost robot-like ability to recall 5 year old blog posts. I’m not freakish by any means in terms of size. 5′ 7 3/4″, weight about 156 pounds. Chest is about 38, my waist fluctuates between 32 -34″ depending on the season. My Sleeve length is a hair over 32″ . I cannot buy anything, from most any makers, that comes close to fitting. Price is seamingly not helping with fit. Grab a small shirt? I’d have to be 6 ft, 210lbs to get close to it fitting. grab a 15 or 15.5 32/32 shirt.. Ha.. Go in a Loro Piano shop? same thing. Stroll down Jermyn street . ha.. Ooo a Zegna store!! ditto.. You guys have Brioni? yea right. Funny.. the only things that come close are J Crew.. ugh.. I have my fill of Linen summer shirts.. The tailors I go to, destroy the stitching, butcher the arms… Going bespoke? the choice of fabrics Is limited and WAY over proced. To be honest, with the exception of the A&S strides, I don’t see anything remotely interesting here. Knitwear can be extremely stylish and every time I visit the A&S Haberdashery or Drake’s I invariably find something truly interesting and stylish but this is just bland. I also think that hoodies are a style faux pas beyond redemption. Jason King would not approve! Yes, I didn’t think it would be your kind of thing David…. It’s a nice fitting jumper in a lovely colour. What’s not to like? I would agree. One needs to be careful not to envelop oneself in the sartorial world to the extent where the sense of reality becomes blurred in order to strive for sartorial edginess. The pieces Simon commissioned here, is basic simple streetwear. 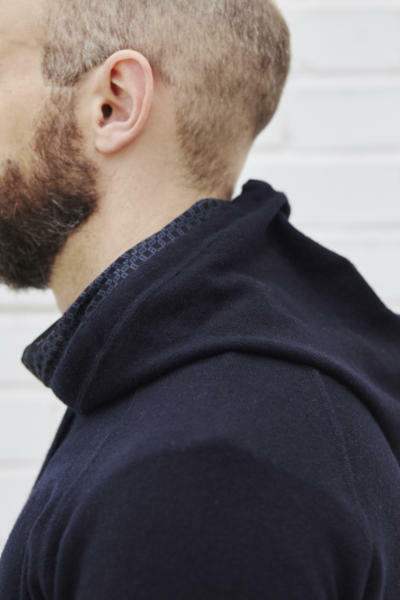 Cashmere hoodies, are an expensive faux pas. Both pieces look great. I particularly like the look of the hoodie and that Hermès scarf was a nice touch. I’ve been a big fan of Saman Amel and it’s great to see you giving them praise. Simon, which shoes did you wear with the brown sweater? I mostly wear dark brown shoes and often find it difficult to achieve sufficient contrast with knitwear in this shade of brown.. If you’ve got white leather trainers in your wardrobe then I feel those would be a good choice too. Funny, I always wondered why I liked their zippers so much more. Now I understand, it’s because they are colored plastic which blends in more. Good insight. I think zippers that blend in are better. Wearing an Hermes scarf is a good one. Wearing to the same colour is a big faux pas Simon. Why not the pinks or yellow or green to make contrast? Know a bit more the skill of contrast. Deep blue and deep blue are not an ensemble of style, sorry. Thanks Herve. I like tonal looks, but clearly you have more courage than me in bright colours! I think the hoodie scarf colour choice is perfect. I feel the brown jumper is too short in the body and the sleeves too long, but maybe it’s just me. Personally, I think that both of these look great. 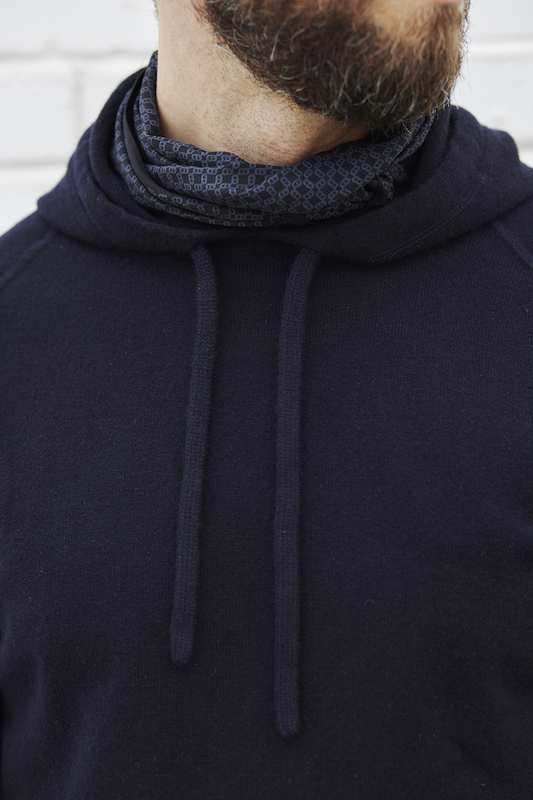 The scarf subtly adds something to the hoodie and I’ve always been a big fan of half-zip sweaters, which I usually wear with a t-shirt underneath (pretty much the only time I wear t-shirts!). Having slightly short arms for my height, I often struggle to find knitwear with an entirely satisfactory fit. I’d be interested in giving Saman and Amel a go if I can make one of their London visits. My experience of buying better quality knitwear has been very disappointing because the sizing is so off (N Peal particularly disappointing but John Smedley, with their choice of three fits, has worked well for me). But anyone who offers MTM in this space is potentially onto a good thing. However, a MTM cashmere hoodie? Not for me, thanks. The cashmere is lovely indeed, but if you feel it’s too much, it’s worth pointing out they also offer cotton and merino wool. 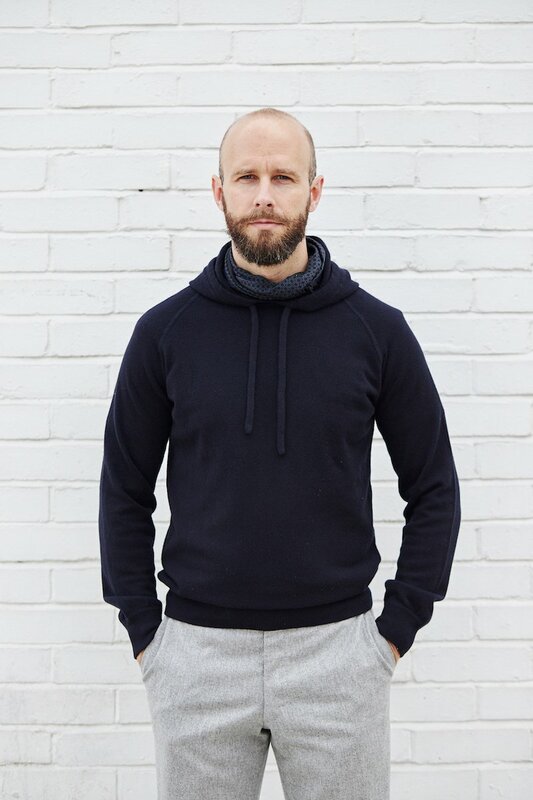 I just picked up a long sleeved knit polo in their merino offering, and it’s easily the best merino wool I’ve ever seen, touched and worn. It’s dense and very soft, while remaining light. I highly encourage everyone to check it out. These sweaters look good and considering the effort involved they’re not expensive. But they look tailored and with knitwear don’t you want to look a bit relaxed? If you can find a really good quality cashmere off the peg it should hang really well on a figure like yours – you wouldn’t need bespoke. In the old days Ballantyne or McGeorge were brilliant. I don’t know if there are any equivalents today. That’s just how my arms hang I’m afraid – the pockets aren’t pushing them! The pockets are pretty heavily used though, and you’re right they’re being pushed forward and out as a result. 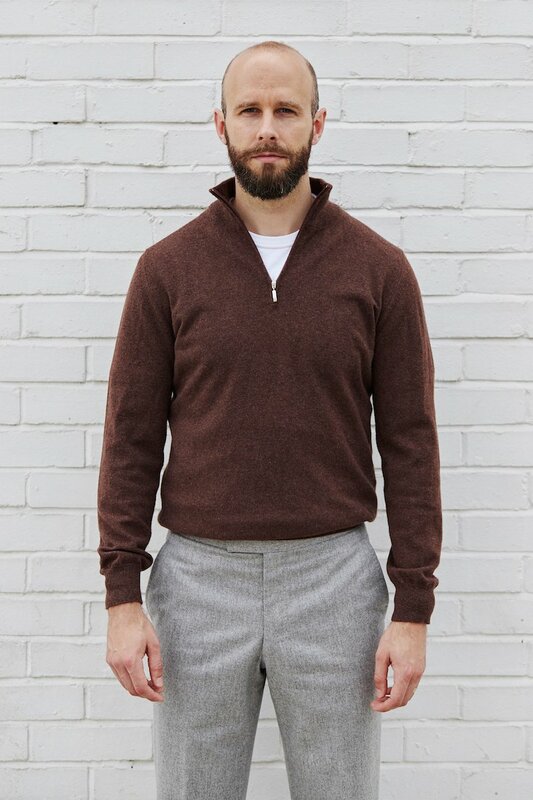 The brown half zip does not cover the trouser waistband (in the photo at least). Isn’t this rather short compared to what would be conventionally considered a ‘good’ fit? Simon – is there a rule when it comes to knitwear arm length? To my eye the arm length on your half-zip looks a touch long, gathering a touch too much so would be interested in your thoughts. We’re you not tempted to go for buttons instead of a zip? 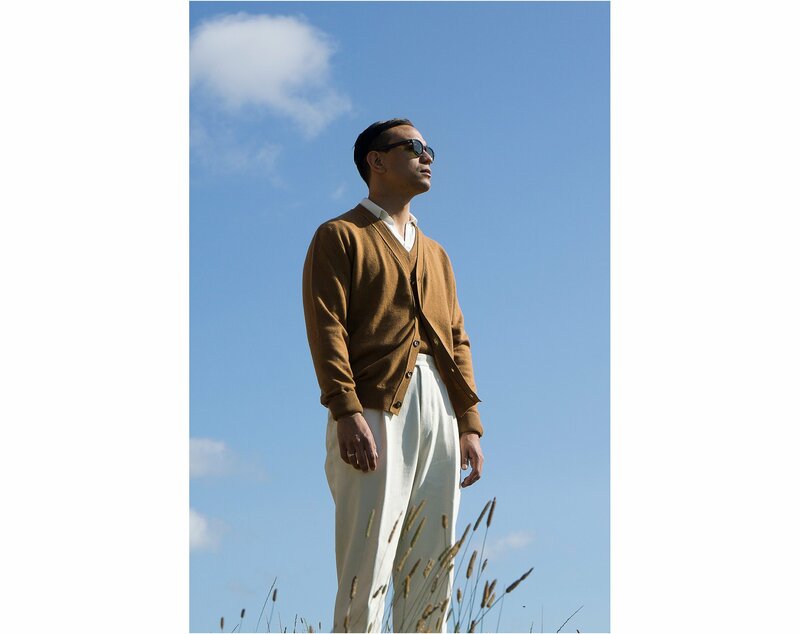 I have a similar jumper in merino wool from Johnson’s but with buttons. Love it. pilling. I’m 5ft 8” with a 38in chest and 31in waist and the small fits me perfectly. Without wishing to get into any kind of spat about this – my experience of Maison Cashmere in terms of fit and colour was not good (the service, and returns, were though). The fit of the small was so bad it was comical. There was no tapering to the waist/hem, so the cardigan was very sack-like. The hem itself was not straight. And it had arms so long that even Mr Tickle would need to roll-up. Finally – the navy was not navy to my eye at least – it was a much more of a denim colour. So – no beef here – just sharing my particular experience. I’m really interested in this. It is also about being practical, and being able to dress appropriately for the occasion. It’s not always possible, practical, sensible or relaxing enough to dress like you’re strolling to Pitti, or along Saville Row; so a more casual fabric and style, but which clearly fits and is in balance, is an important part of a versatile wardrobe. Simon – did they give any hint as to doing a shawl neck cardigan? I’m interested in the hoodie, but I know what I really want is the cardigan. I’ve looked (online, not in real life) previously at the Drakes and A&S ones but couldn’t quite get to £800, although based on the price for the hoodie, I suspect Samal Amel would be similar if not more?! These half zips have grown on me over the years from when you posted about the Loro Piana Roadsters, are you aware of a relatively affordable option. Although, these are very competitively priced. Slightly unrelated, when you’re not wearing a crew neck over a shirt, do you just wear a t shirt under instead? If you had described a cashmere hoodie to me I would have laughed but I stand corrected it is a very elegant garment and suits the shape of your torso well. The other observation I would make is s little more depressing. The seat seam on those AS Flannels is a mess. Given the problems with the hind arm on the blue jacket that you recently posted I wonder about the integrity of their cutters or do they need to visit Specsavers. No self respecting Cutter would allow work like this leave the premises in the full knowledge that it is likely to go public. Just wanted to say I am so glad you posted this as I was unable to find a well made polo in a cream colour; I just wanted something well made, simple and understated and their Amo polos look perfect. Although I am somewhat of an “amateur” In my opinion it looks like something which could be worn with tailoring or more casually, but I suppose that could be subjective. Depending on my thoughts on it I may try out their mtm service next time they are in London and I can get there. Thanks Simon, great write up and choices! First time visitor to your site which is great! I came here to try to get some insight on whether there are any major clothing labels left these days that manufacture good quality knitwear (i.e., sweaters, jumpers, etc), more particularly because I understand that custom knitwear isn’t something that is readily available. For example, once in a while I’ll see a high end brand ready to wear sweater (e.g., YSL, D&G) that has a design that I really like, but now being a more educated consumer, I hesitate because I don’t know if the quality of the knit is any good or if the piece is truly 100% “made in Italy” as the label claims. What’s the reason behind your having only one back pocket on your trousers (instead of two) and, since you don’t seem to make use of it at all, have you ever thought of forgoing back pockets altogether? 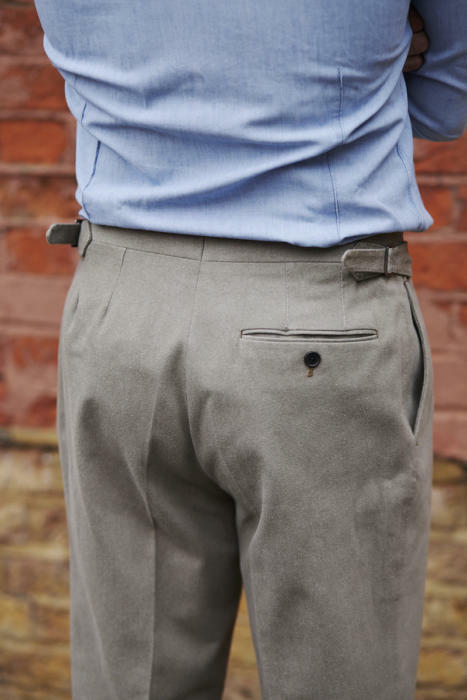 It’s a small thing, but generally two hip pockets is more casual, as it having them with flaps or a flap for the button. I have tried having no pockets historically, yes, but it looks too plain, and almost like your bum is on display more. I might have it with something very smart, such as black tie, but certainly not on casual trousers like this.